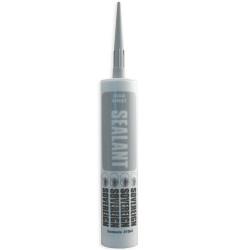 Lead sealant is a flexible, weatherproof compound, manufactured from silicone rubber. This modern alternative to traditional mortar is becoming increasingly popular in the roofing trade for chasing in lead flashings. Unlike mortar, lead sealant will accommodate the expansion and contraction of the lead sheet due to changing temperatures. Pointing created with this type of sealant can last for 20 years without cracking or crumbling. The other big plus with these sealants is the easy application. Packaged in a standard mastic tube, there’s no mess or mixing involved – just pump the sealant into the joint with a mastic gun. The ‘neutral cure’ formula ensures that there are no acid stains left on the lead after setting. Though not designed as an adhesive, when fully cured these sealants form a tacky bond between lead sheet and masonry. To make the job even easier you can also use our special lead fixing clips to secure the flashing before sealing. Lead sealant can be used in almost any weather: in the heat of barbeque summer or the freezing depths of an icy winter. You can see why it’s so popular with keen DIY’ers and experienced roofing professionals. Our Premium Lead Sealant is even recommended by the prestigious Lead Sheet Association for the rapid installation of lead flashings.